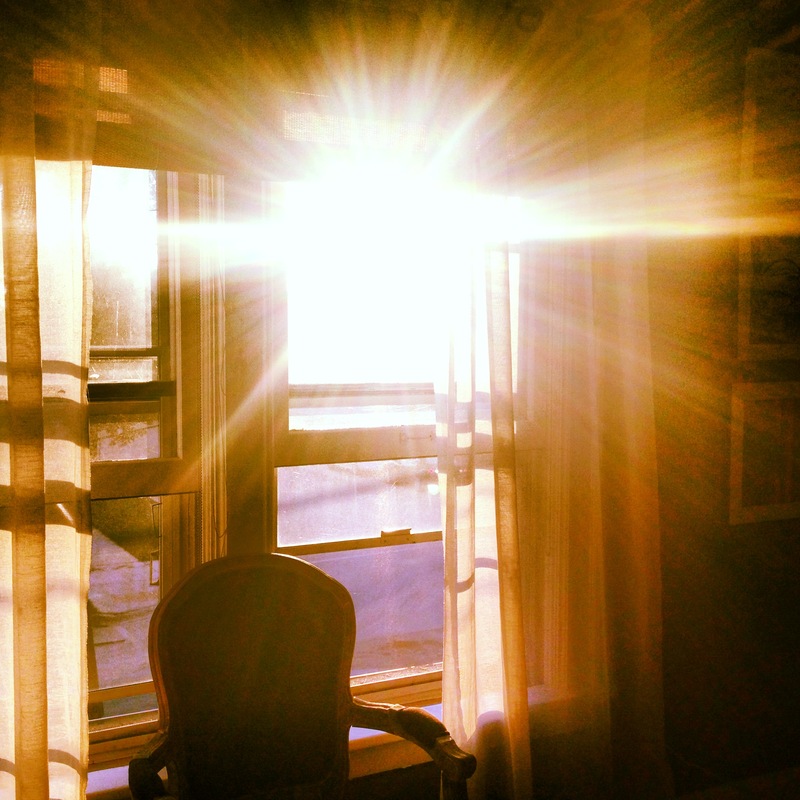 Morning sunshine, the universal signal to start seizing. My bedroom window in WI. Seize the day. Carpe diem. Grab the bull by the horns. You can sleep when you’re dead. I totally get it. You want every day to be the best day of your life. Maybe the thought you might die tomorrow motivates you for today. Like, OMG, if I get hit by a bus tomorrow, is this really how I want to spend my last day? Or maybe you were born with enough energy to last two lifetimes. Maybe you feel guilty doing nothing because you’re lucky enough to lead a life where you can do almost anything, which isn’t true for so many. Maybe you’re still in college, aka, the ultimate opportunity for all kinds of moment seizing. But over the years, I’ve had to re-evaluate exactly what it means to seize the day. At some point during my college years, “seize” became inseparable with “booze.” Every weekend (okay, every weeknight too…I can still name all the daily drink specials promoted by different pubs, successfully luring me somewhere Mon-Thurs) I felt compelled to paint the town red (and white, Go Badgers), because hey, this was college after all, riiiight? When else could I get away with this kind of ridiculous behavior? Better seize those college years while they were still there to seize. I obviously had no idea adults are just college kids without college back then. So, I did a lot of seizing. Sometimes, I’m amazed I made it out. Senior year, my friend Michelle used to save me a seat in our 8:50 English lecture, and when I showed up in my clothes from the night before, she’d hand me a pen and paper for notes I never took, and a piece of gum that did little to mask my boozy hot breath, and nothing to mask the cigarette smoke my threads puffed out in her direction. For some reason, I thought this was better than not showing up at all. Michelle probably disagrees. 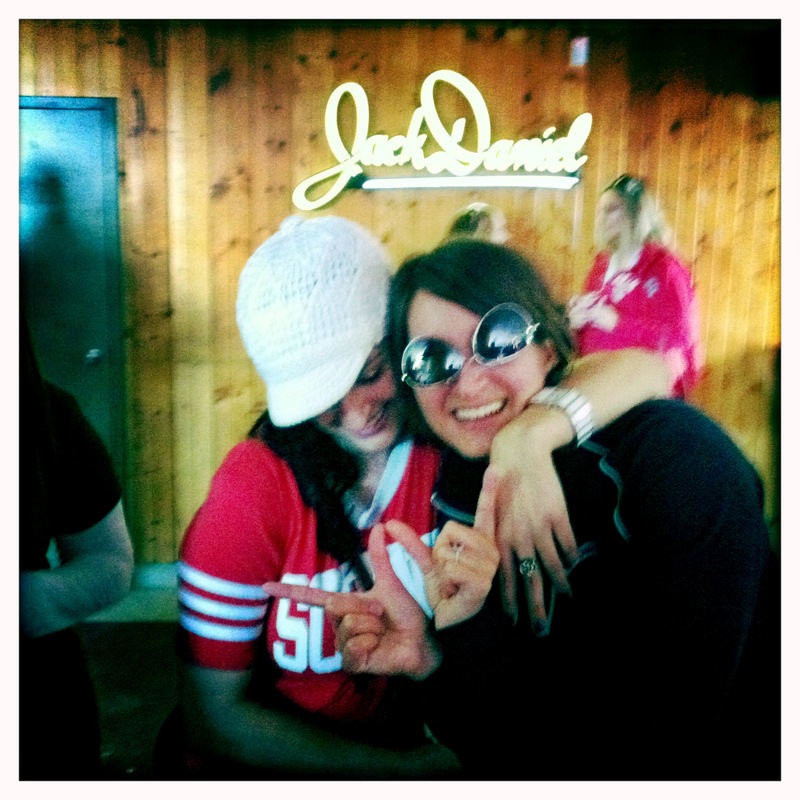 Seizing the Badger day with my sister, ten years after college. As I gained more responsibility and less ability to handle hangovers, I learned to seize days in healthier, more creative ways, though the boozy seize really enjoys popping back into my life (I blame Wisconsin). I’m still learning which days to seize (boozy or otherwise) and which days to just let pass, and travel adds an extra layer of difficulty. Because, yay holiday! I’m traveling the world! I should take advantage of every minute of every moment, because soon they will be gone! But as I slowly wore myself out, I began to wonder what the exact opposite of seizing might be…because I needed me some of that. According to my trusty dictionary (which I’m actually losing faith in, as words like cray cray, YOLO and amazeballs are now totes legit, and literally now also means figuratively), the antonyms of four different verb uses of ‘seize’ are: let go of; relinquish, liberate; release. Okaaaaay. None of those sound so terrible…actually…they sound pretty amazing. I mean, aren’t release and liberation just as important as seizing? And who doesn’t need to let go of something? Even whilst traveling? And if you are cursed like me, all moments are practically begging for seizure. But I’m learning to recognize good seizable moments and bad seizable moments. For example, Scottish David and I caught a train to Edinburgh for a late night comedy show at the Fringe Festival, and couldn’t be bothered with thinking about how we’d get back to Glasgow. 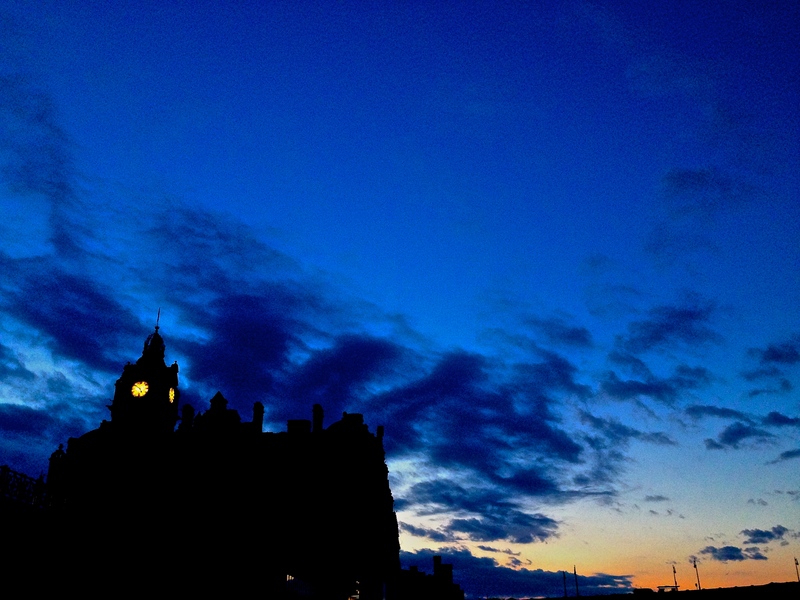 While indulging in whiskey and crepes, absorbing the festival atmosphere and the magic of Edinburgh, we made a sort of conscious decision to miss the last train back, and just see where the night took us. We made friends with bartenders, joined a casino, won £40, overstayed our welcome at the casino, possibly by falling asleep on the comfy couches, took a rickshaw down Leith Walk because Scottish David thought he remembered bars opened early, but instead ran into the Singhs brothers, who laughed at his misinformation and instead offered us strange beer from the boot of their car as the sun came up, which we accepted, while wisely refusing their other offer to come up to their apartment before catching the first morning train back to Glasgow. We spent Sunday letting go, aka sleeping. A solid seizable moment. But some moments are better left unseized. The flight to Ibiza was a shitshow, loud as a pub, most passengers a perfect concoction of everything I dislike about places like Ibiza. A line for the bathroom formed while we were still parked at the gate, and the pilot had to remind everyone more than once we couldn’t take off until everyone took their seat. As soon as the seatbelt sign went off, people literally jumped over each other to wait 20 minutes in line for 15 seconds of relief. When we deplaned, the flight attendants were almost in tears. Lucky for me, I had the pleasure of sitting next to a few stars of the show. On my right was a 40-year-old Glaswegian who pulled out a bottle of coffee Patron before the flight took off and offered me a swig. Bottle 3/4 empty, no amount of shaking could wake him when we landed. On my left, an extremely vocal, way too tan,18-year-old platinum blonde, wearing enough makeup for an entire cheerleading squad, pulled out her plastic liquids baggy packed with mini toiletry bottles filled with vodka, and pumped (literally) herself a strong cranberry vodka. She made herself comfortable, sitting in the middle of the aisle for much of the flight, blasting Miley from her little portable boom-box, making the flight attendants walk around her. Obviously, I immediately judged her based on…well, everything, but she actually turned out to be pretty hilarious and friendly, definitely seizing every second of every moment on that plane. After my initial awe and horror subsided, I made an executive decision to not be annoyed and tried to enjoy everything happening around me. I especially enjoyed the moment my new BFF passed out, slumped over in the seat next to me, then as the plane landed, bolted out of her seat and ran to the front of the plane, covering her mouth, trying to unsuccessfully hold back vomit. Perhaps the plane ride wasn’t the best moment for her to seize. There’s no point in getting into the moments seized in Ibiza, as it’s one of those places it’s basically impossible to justify actions or understand thoughts without being there. Just know it was pretty much as I expected, though I allowed myself to enjoy it a lot more, beaching away the day and unce-unce-uncing away the night, especially the last day, when the beaching bled into uncing, which bled right back into beaching, totally eliminating the sleeping. Some definite good moment-seizing. 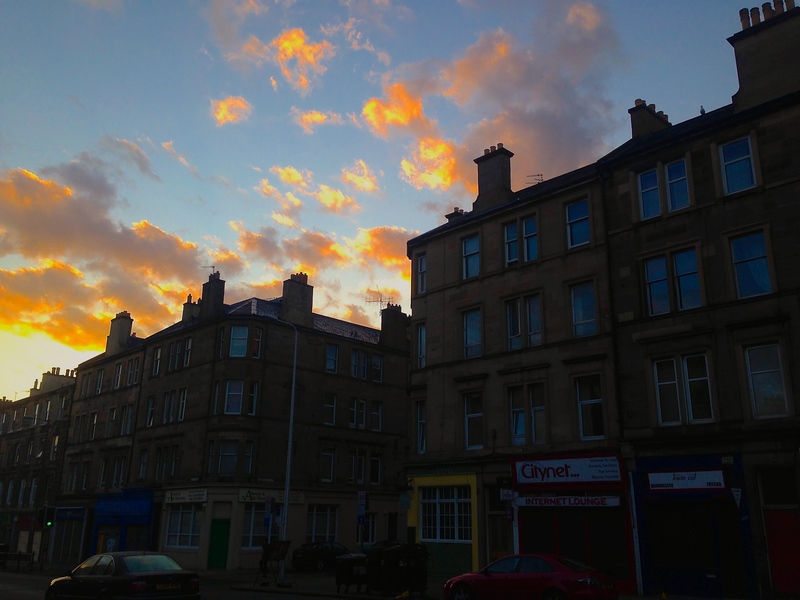 Back in Glasgow I slept for 1.5 days straight, seizing no day, no moment, as I’ve learned it’s impossible to seize every moment without numbing yourself to some of those moments, in which case, what’s the point? And I don’t want to sleep when I am dead because I enjoy the restorative power of sleeping now. And maybe in order to seize the next moment, you have to take some time to un-seize the previous moment, let your fingers relax a bit before they can grab onto anything else. Otherwise you’ll find your fingers are slow, clumsy and uncoordinated, totally out of it. Moments mix together, your memory gets confused, life becomes a jumbled mess. So by all means, seize away. Just don’t forget to let go. Or you might vomit on the airplane before the real moment even begins. If you’re thinking, hey where are the pictures of Ibiza? I didn’t take any. I left my camera in Glasgow and didn’t turn my phone on once in Ibiza. Trust me, it’s better that way. 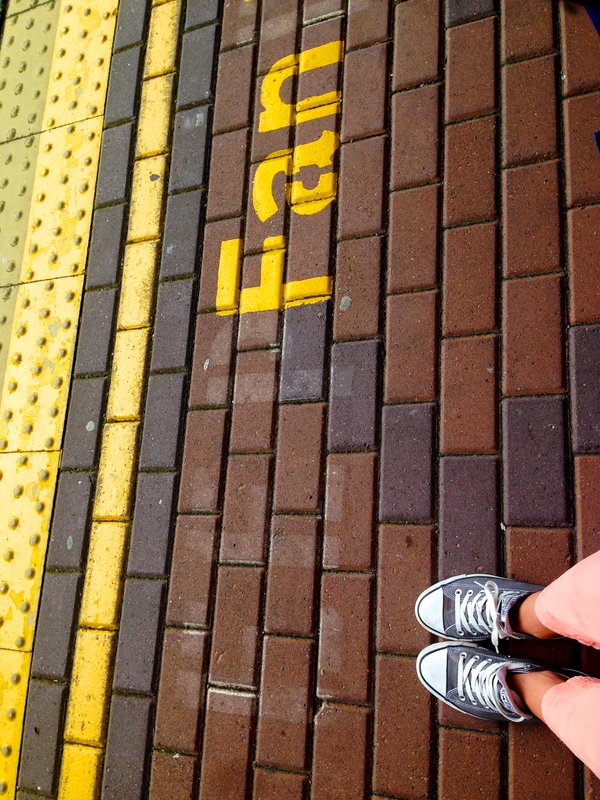 So here’s a photo of my shoes at a train station. Thanks Teri! I made it out alive. And as much as I rely on the internet while traveling, it’s an incredible feeling to disconnect for a week or so. I should really do it more often. Thank you for another wonderful eye-opener. Maybe it’s a little bit of age and lifestyle because historically I never was a big sleeper but now, yeh. I came back from camp and knocked out for a solid day only to wake up unable to do anything because I had inadvertently cramped my neck causing me to move delicately for the next day and a half. But what I have learned is that carpe diem no longer means what it used to. Carpe diem, do what does, do it to it, first try or die, die living, kill yourself… Their meanings are hollowed while they wait for the new I to emerge from transition and redefine them. Maybe we’ll create our own carpe diem. You really did smell on those mornings. And were not sober. And that one time you thought you got an A+ on a paper but it was just a sloppily written C. Oh man I laughed and laughed. Haha, I forgot about that. I thought I was sooooo brilliant.